In 1986, when the Voyager 2 probe flew past Uranus, it detected ten previously undiscovered moons orbiting the blue-green gas giant. Uranus’ moon total currently stands at 27, but if analysis by planetary scientists at the University of Idaho, Moscow, is correct, Voyager missed two moons during its historic fly-by, reports Ken Croswell at New Scientist. Reexamining the Voyager data, planetary scientists Rob Chancia and Matthew Hedman noticed that two of Uranus’ rings, Alpha and Beta, had a wavy pattern. Previously scientists observed similar ripples with the rings caused by two of the planet’s other moons, Cordelia and Ophelia. The gravity of these two moons and the couple other dozen orbs zipping around the planet, force the space dust and particles into narrow rings. Researchers believe these latest wobbly rings have a similar source: another two moons around Uranus. Their research will appear in the Astronomical Journal. “These moons are pretty tiny,” Chancia tells Croswell. In fact, if they exist they are between 2.5 and 8.5 miles across. The moons are so small that even if Voyager 2’s cameras did pick them up, they were probably just considered background noise, reports Charlotte England at The Independent. Even so, as Croswell points out, two of Saturn’s moons are even smaller. Based on the colors of Uranus’s other moons, the new satellites are probably also dark in color. 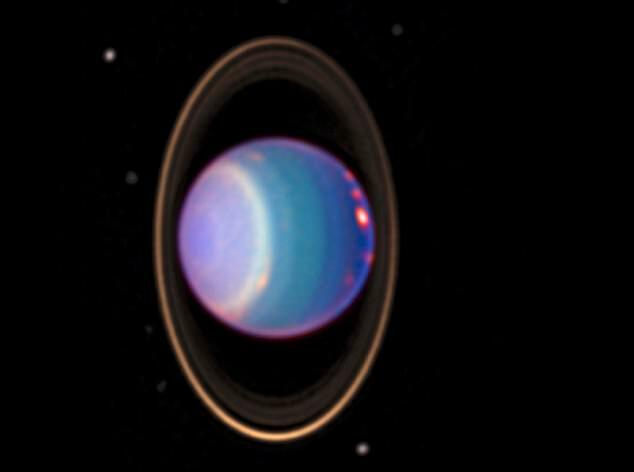 “Not only are Uranus’s rings dark, so are most of the little satellites that are in that region,” Hedman tells Croswell. Confirming the moons would require using the Hubble Space Telescope to survey the area. In fact, in 2005, Mark Showalter of the SETI Institute discovered several rings and two new moons around Uranus, which were named Mab and Cupid, using Voyager data and Hubble images. “The new discoveries demonstrate that Uranus has a youthful and dynamic system of rings and moons,” Showalter said at the time. Showalter tells Croswell that he and his colleagues will be examining Hubble data looking at Uranus in the coming months, which may help confirm the new moons. If the moons don’t show up during that survey, the final option is waiting for a probe to visit the distant planets. While there are no firm plans to send an orbiter to explore the area, last year NASA asked the science community to think about the types of robotic orbiters needed to visit Neptune and Uranus—the only two planets in the solar system that have not been orbited by probes. If NASA does green light a mission, it likely won’t get off the ground until the late 2020s or early 2030s.